It would be recalled that security operatives had in the early hours of Monday (24/12/2012), illegally arrested Editor and Reporter of the said paper, Musa Muhammad Awwal and Aliyu Saleh, respectively, to location still unknown. They are still in detention for six days without charges. 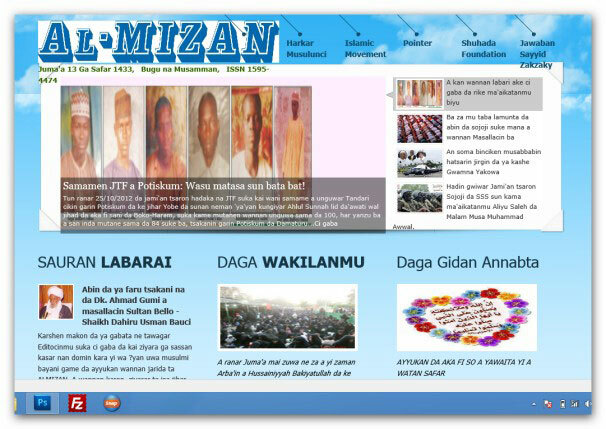 Again, in what appeared to be a follow up siege on Al-Mizan and its staff, on Thursday afternoon (27/12/2012), plain clothes security operatives in a white Peugeot (Boxer) with no registration number, stormed the office of Al-Mizan newspaper located at Yoruba Road, Oriapata, Kaduna, with the sole intention of arresting its Editor-in-Chief, Ibrahim Musa. The security operatives met two men in the office and asked them whereabout of Ibrahim Musa, and having received no satisfactory answer, left. They later came back and ransacked the office in a wild search, took away computers and other items yet to be ascertained. residents of the area expressed shock at the uncivilized attitude of the security men on innocent citizens in broad daylight.